Sugarcane Aphid was found late last fall in Charles County, Maryland in a sorghum field that was being harvested for grain. Aphid populations were very high, with feeding present in the grain head and leaves. This is the first time that sugarcane aphid has been found in Maryland. While this aphid has caused substantial losses to sorghum in states to our South, it is unknown if the aphid will be present early enough and at high enough populations to cause significant injury in Maryland. Growers are encouraged to monitor sorghum fields through the summer for the presence of sugarcane aphid. We suspect sugarcane aphids are most likely to arrive later in the season in Maryland. The sugarcane aphid is a relatively new pest of sorghum. As the name implies, the sugarcane aphid was historically only a pest of sugarcane fields. It was first found in the United States in 1977 in Florida and moved slowly throughout the sugarcane regions of the southeast. However, it started showing up as a major pest in sorghum fields in 2013 in the sorghum producing regions of Louisiana and Texas. It has since migrated through most of the southeast causing significant injury to sorghum. It was found as far north as Virginia in the 2015 and 2016 season. It is still unclear if this is a new biotype introduced from South America capable of infesting sorghum, or if there was a shift in the aphid populations in sugarcane in the southeast US adapted to sorghum. However the shift occurred, sugarcane aphid is now the most significant insect pest of sorghum in the US. 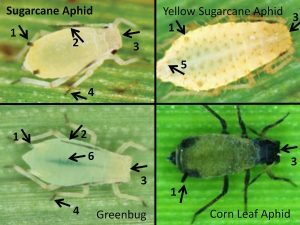 Sugarcane aphids require a living host to survive. The aphids will overwinter in the warmer regions of the southeast United States on volunteer sorghum, johnsongrass or sorghum-sudan grass. They begin their migration north as spring temperatures warm. The winged adults can be carried long distances on wind currents. Sugarcane aphids are all female who give birth to live pregnant young. Young immature aphids mature to adults in only 5 days and live for up to four weeks. These characteristics allow sugarcane aphid populations to increase very quickly, especially during the hot summer months. As with other aphids, sugarcane aphids have piercing/sucking mouthparts that are used to extract nutrients from plant sap. Sugarcane aphids feed on the underside of leaves towards the base of the plants. Once the plants head out, the aphids will feed in the grain head. The sugarcane aphid produces large amounts of a sugary sticky substance called honeydew. Leaves will often appear glossy or shiny and may be covered in a black sooty mold. The honeydew substance can gum up combine heads and prevent harvest. These aphids will feed on sorghum all the way through harvest. If infestation occurs early enough, sugarcane aphids can greatly reduce yield potential and even kill plants. In Maryland, we expect the aphid to occur much later in the season, if at all, with the potential to cause some yield loss, reduction in test weight and potential harvesting issues. There are several species of aphids capable of infesting sorghum. Sugarcane aphid can be distinguished from other aphids by black feet, antennae and cornicles (tailpipes) (See Figure 1). The overall body is normally a yellow, gray or tan color. Adults are typically wingless, however can develop wings, especially when confronted with stress or adverse conditions. If you find aphids in sorghum, please contact your local Extension Agent for help in confirming their identification. Figure 1. Common aphids of sorghum. Sugarcane aphid (top left) can be distinguished by a smooth body combined with black cornicles (tailpipes, arrow 1), black antennae (arrow 2), a pale head (arrow 3), and black feet (arrow 4). Yellow sugarcane aphid (top right) is a different species that has very short cornicles (tailpipes, arrow 1) and rust colored hairs on the body (arrow 5). Green bug (bottom left) is the most similar to sugarcane aphid but can be distinguished by a dark stripe down the middle of the body (arrow 6). Corn leaf aphid (bottom right) has a dark head (arrow 3). Photos from aphids reared by Dr. Scott Armstrong, USDA-ARS, and photographed by Rick Grantham. Because the sugarcane aphid is a newer problem to our region, recommended threshold levels vary and are based on what is recommend in other areas. Treatment is justified when 50-125 aphids per leaf are present on 25% of plants. To avoid yield loss, insecticide applications must occur soon after threshold populations have been reached. Texas A&M has produced a scouting guide to help estimate the number of aphids per leaf: http://ccag.tamu.edu/files/2016/04/NTO043.pdf. ALWAYS read and follow all instructions on the pesticide label; the information presented here does not substitute for label instructions. Sivanto 200 SL (IRAC Group 4D, Bayer CropScience) is registered for use in sorghum in Maryland and has a section 2(ee) label for reduced rates (a lower 4-5 ounce rate works well at threshold, for higher numbers a higher rate may be justified). Sivanto Prime (IRAC Group 4D, Bayer CropScience) may also be used (excepting sweet sorghum) but reduced rates have not been labeled. One application should be enough in most situations, unless populations are well above threshold during the first application. Control should be evaluated 4 days after application to ensure that populations have been reduced below threshold. It is important to obtain good spray coverage. A minimum of 10 gallons per acre spray volume is required for ground applications to ensure adequate coverage. 20 gallons per acres is preferred. Also note that Transform WG (IRAC Group 4C, Dow AgroSciences) is often recommended for use in other states but is NOT registered for use in sorghum in Maryland and thus cannot be used. Pyrethroids (IRAC Group 3A) such as Warrior, Baythroid or Asana are not recommended for sugarcane aphid as they are not very effective against this pest and may kill natural enemies resulting a spike in aphid populations after application.